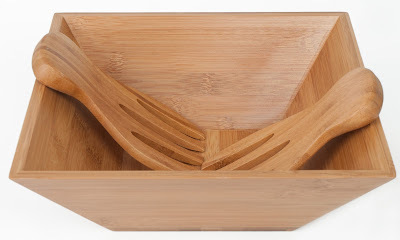 The SM Bowls Bamboo Salad Bowl w/ Serving Hands is an essential piece in every kitchen! Versatile, durable, stylish and made from sustainable bamboo - this set has it all and will quickly become one of your most-used serving bowls. 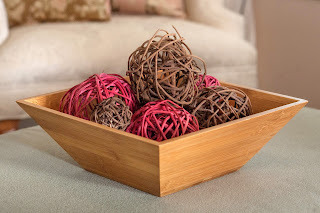 This attractive, perfectly sized bamboo bowl is not just for salads! Use it to serve fruit, chips, pasta salad or rolls; or fill it with decorative items and use it as an accent piece anywhere in the house! The timeless style of bamboo complements any dinnerware - use this bowl and matching servers for casual as well as formal meals. 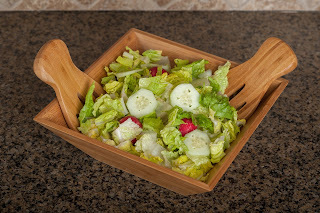 Bamboo is a durable, long-lasting material, and our high-quality craftsmanship guarantees you will be using your salad bowl set for many years. 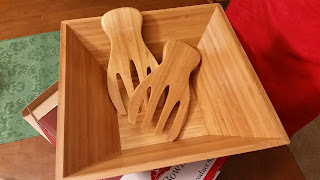 The matching set of bamboo serving hands is exactly what you need to evenly toss all the ingredients in your salad - even the small pieces - without creating a mess. Simple yet stylish, the serving hands are comfortable to hold and are much easier to use than tongs or other salad servers. With this set you get the rich look of a wood salad bowl with the assurance that you have made a good choice for the environment. Bamboo is a rapidly renewable material. Bamboo is easy to clean and care for. Hand-wash your salad bowl and serving hands in warm, soapy water (but do not soak). Rinse, then wipe away excess water with a clean, soft cloth. Allow the set to air-dry completely before storing. SM Bowls offers you stylish, practical serving solutions for your home. 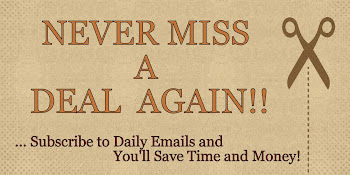 If for any reason this product does not meet your expectation, we will send you a new one for free at our cost. No questions asked. Right out of the box, I loved this serving bowl. I could tell right away, it's very well made, high quality and very durable. I love the look, shape and modern design of this bowl, it's simply beautiful. I've been needing to get a new salad bowl and I am so happy with this one. It's a great size (11-inch) and can be used to hold anything from a salad, chips, rolls, etc. It looks great on my table. Perfect for entertaining or just dinner with my family. 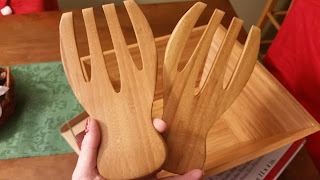 The set also includes two serving hands which are nice and big. Great for tossing and serving a salad. Both the handles and the bowl are made of bamboo, sturdy and gorgeous. Overall, I'm very impressed with this bowl. I would definitely order this again as a house-warming or wedding gift. I would even order another one and use it as a decorative piece for my coffee table. Great product, would highly recommend it. If you would like to try these out for yourself, you can purchase this Bamboo Salad Bowl w/ Serving Hands right now from Amazon! Disclosure: I was not financially compensated for this post. The opinions are my own and based on my personal experience with the product. I received the product mentioned above for free or at a discount for my unbiased and honest opinion. Regardless, I will only recommend products or services I use personally and/or believe will be good for my readers.